The Official Football Knitted Beanie Hat is ideal for wearing during the colder months and makes a great gift. The hat is club colours and has an embroidered club crest on the front. The hat is 100% Acrylic and one size fits all. Hand wash only. 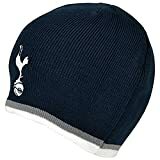 This Knitted Hat is an official product and is produced under licence for the respective Football Club. All Hats come with the official club shop tags and would make a great gift for any fan!